JC Pool Services - Pool servicing Brisbane, stores located in Norman Park, Fairfield and Wishart. With pool maintenance and pool servicing from $65 a month sleep easy knowing your pool and equipment is well looked after. Welcome to JC Pool Services specialists in swimming pool equipment and servicing residential and commercial for any questions do not hesitate to call, have a great swim! JC Pool Services, the leaders in swimming pool care have been providing professional mobile services for Brisbane pool owners for over 15 years. We are a fully registered and QBSA licensed Brisbane pool service company with six fully equipped pool service utes on the road daily. Our team of trained pool technicians provide prompt service and can assist in all forms of pool service work, big or small. Whether recovering your pool from green, repairing damaged pool equipment, cleaning up after a big storm, fixing your automatic pool cleaner or helping with an insurance claim, we offer you all the help and support you need. Specialists in pool servicing and equipment, residential and commercial / aquatic centers. 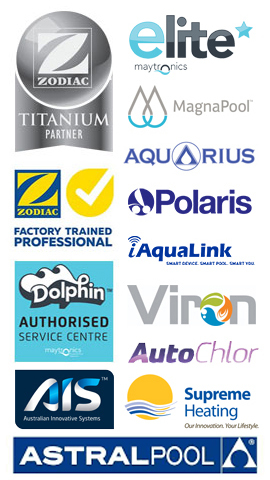 We not only specialize in residential swimming pools but conduct complete filtration repairs and replacements for commercial swimming pools as well as supply, install and provide training for commercial advanced water treatment controllers by Aquarius and Prominent, salt water chlorination systems by AIS, robotic pool cleaners by Maytronics, supply bulk swimmiing pool chemicals and many commerical services for Brisbane & Queensland. With three locations around Brisbane, Norman Park, Fairfield and Wishart and collaborative sources no matter which store you visit your test and pool history and information is available. If you're looking for professional pool services and equipment in Brisbane, phone us now on 1300 117 665.